Adobe Flash on webOS has had a long sordid history. It was supposed to come early in our favorite mobile operating system’s life, but didn’t make it onto the platform until webOS 2.0 was finally released. By then, we were looking at Adobe Flash 10.1, which runs okay on the Pre 2 with its 1GHz processor and 512MB of RAM. But what of the HP TouchPad (due out at the start of next month)? Well, we knew from the start that it was going to run Flash, and thanks to HP’s updated TouchPad page (hp.com/touchpad, which redirects to typical HP indecipherables), we can confirm that it’s the tablet-friendly Flash 10.3 beta, the same version that’s used on Android 3.0 tablets and the BlackBerry PlayBook. What’s this mean? It means that Flash is going to run like a lion chasing down a gazelle on the Serengeti (i.e. fast). Granted, it does help that the TouchPad will have a dual-core 1.2GHz processor and a full gigabyte of RAM to move things along, but tablet-optimized Flash is also a good thing to have on board. Now, Flash 10.3 does have a lot of tablet-friendly goodies in it like gesture support and sub-pixel text rendering, but we aren't expecting much of that on the TouchPad. Why? 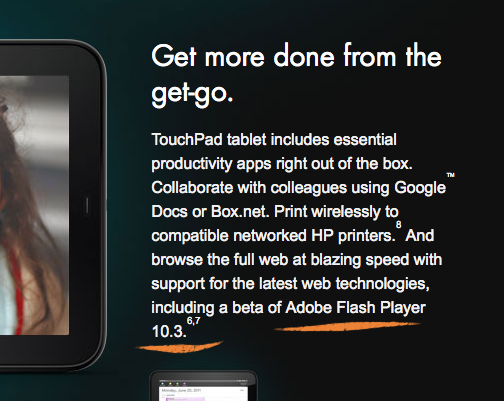 Well, that's for Flash apps, while the TouchPad will just be running Flash in the browser.